揂t an early age, Am閘ie Talexis began studying piano and cello at the Toulouse Conservatory, and then studied singing under Jacques Roudil who had previously sung at the Paris Op閞a and then taught at the Toulouse Conservatory. Her earliest engagement was most likely at the French Opera in New Orleans during the 1897�98 season. It was there that Talexis probably met her future husband, Henri Berriel, who was the director and first baritone of the New Orleans company. During the 1898�99 season, Talexis was the forte chanteuse falcon at Antwerp抯 Th殁tre Royal. Berriel was also engaged there as premiere baritone but was found unsatisfactory and his contract was cancelled. 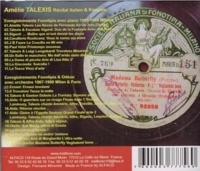 Talexis and Berriel both sang in Montr閍l during the 1899�00 season and in the spring of 1900. Talexis sang 11 performances at the Grand Th殁tre de Bordeaux: Salom� in HERODIADE; Bertha in LE PROPH萒E; both Eudoxie and Rachel in LA JUIVE; Chim鑞e in LE CID.